wrennyn has been a superstar baby nearly sleeping through the night the past 2 weeks. if he does wake up it has been for a very short amount of time. i love having him in our room so much, but if he sleeps through the night it really would be a great idea to transition him into a crib -- which has me thinking nursery thoughts already! nursery thoughts... i know... most people already would have one up and ready by now, but we don't have room for wrennyn to have his own room. i was trying to think of great ways to incorporate a nursery into our master bedroom for the time being. our room is black, cream, and grey and lacking color, so i love the thought of using pale colors with just a pop of yellow to make it warm and cozy. i love the idea of tying in some items we already own and then adding in some new. i never thought i would want to replace the crib my older boys used until i came across this one! 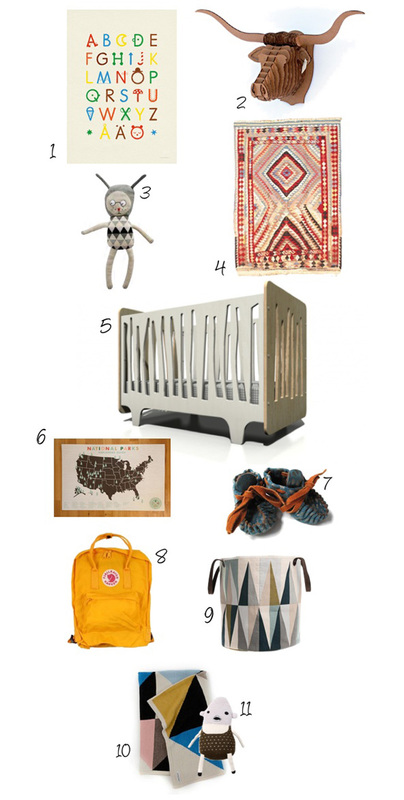 i am in love with this numinumi design funky forest crib, it has so much character! and the crib should always be the statement piece in a nursery! and then there is this amazing rug! it would be a great little place for wrennyn to play once he is a little more mobile. i am really hoping we can figure out something soon, cause he is quickly outgrowing his sweet little bassinet.